Most (though surprisingly not all!) investors like the idea of buying a stock for less than it is worth. But it's the calculation/determination of what a company is worth that trips most investors up. For some securities, however, determining this value can be relatively easy. For example, if a large proportion of a company's assets have a liquid market (e.g. a mutual fund), the calculation can be asserted with much more certainty. While real estate is not quite as liquid as most stocks and bonds, it is not far-fetched to say that a company whose assets consist mostly of real estate should trade near its book value. While some adjustments to book value may need to made to better approximate the current market value of the real estate (e.g. if the land was purchased long ago and has since appreciated), one might expect real estate companies to trade near their book values. Consider Melcor (MRD), a property development company in Western Canada. A large component of Melcor's balance sheet consists of raw land (purchased over the course of a few years) which it prepares and sells as lots to builders. Another large component of its balance sheet consists of commercial property which it has owned and leased for several years or, in some cases, decades. 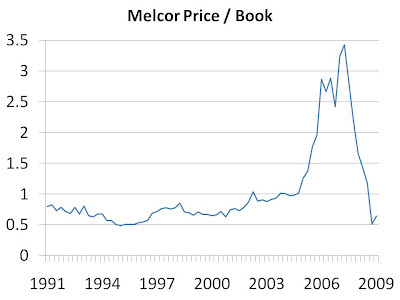 Melcor is trading, relative to its assets, at levels not seen since the mid-1990s. Readers who are pessimistic regarding the outlook for real estate should note that an investment in Melcor does not require a bullish stance on real estate, since this investment constitutes a purchase of real estate at a discount of approximately 50%! The value of the property does not appear in jeopardy either, as while the pace of sales has slowed down, Melcor is still selling its lots at a gain. When investor sentiment sours, those who take advantage of the situation by purchasing assets at a discount stand the chance to gain the most over the long term. This article was written by Saj Karsan, who regularly writes for Barel Karsan. If you enjoyed this article, please vote for it by clicking the Buzz Up! button below.